My cleaning man has become one of my best pickers! He spotted this little table at a local auction for $3! I was picking up another table he's been holding for me, for like a year (he's very patient! ), and he said I might as well have it too. Thank you Keith!!!! 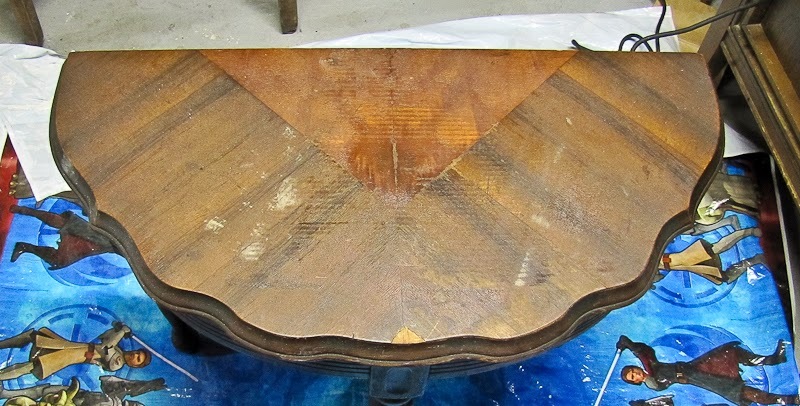 The legs had to be re-glued and clamped because they were a bit wobbly but otherwise a very solid table. This actually had an "S" and an "F" pressed into the burled wood veneer at the back. 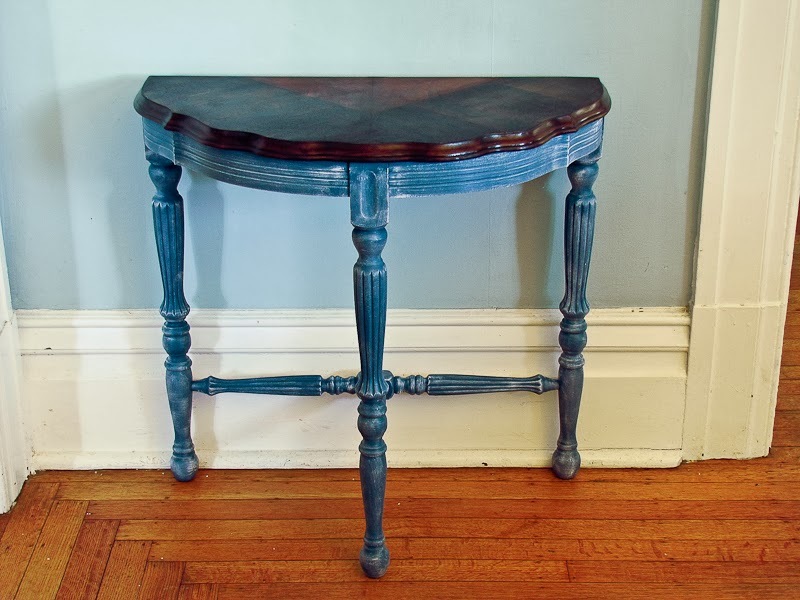 This beauty is now painted with Miss Mustard Seed Milkpaint (MMSMP) in Flow Blue with a white wash over the blue. 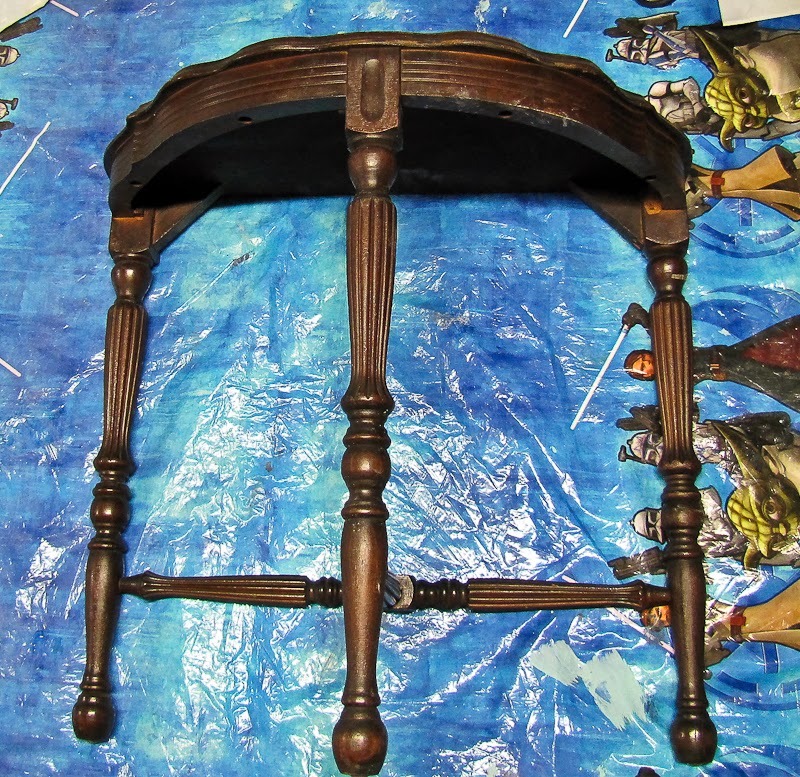 The top got a good sanding and then a coat of hemp oil and then two coats of finishing wax. When i first painted the blue I loved the color but I thought it needed a little something to bring out the details of the wood. 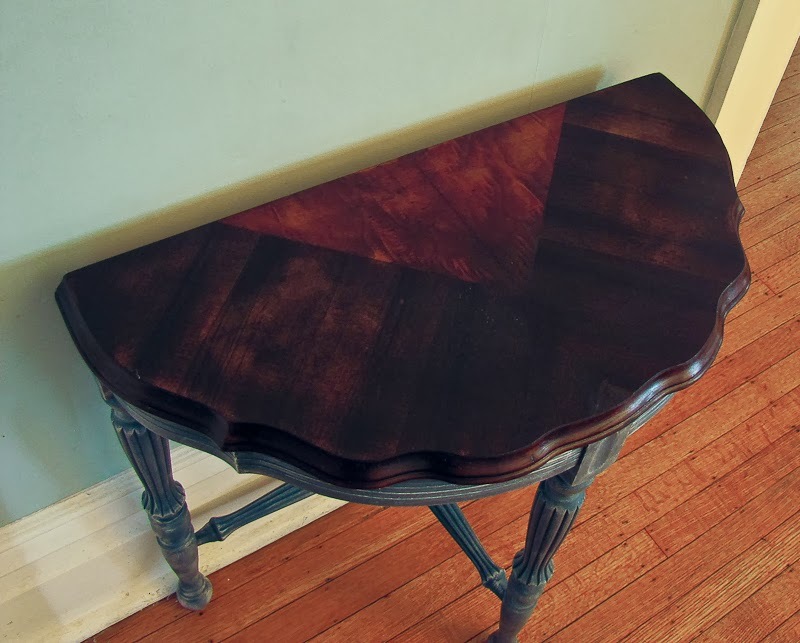 Many people will add stain or dark wax to do this but since the top was already dark, I thought it might make the whole table look muddy. So I found some left over latex paint called Full Moon by Behr and that did the trick! 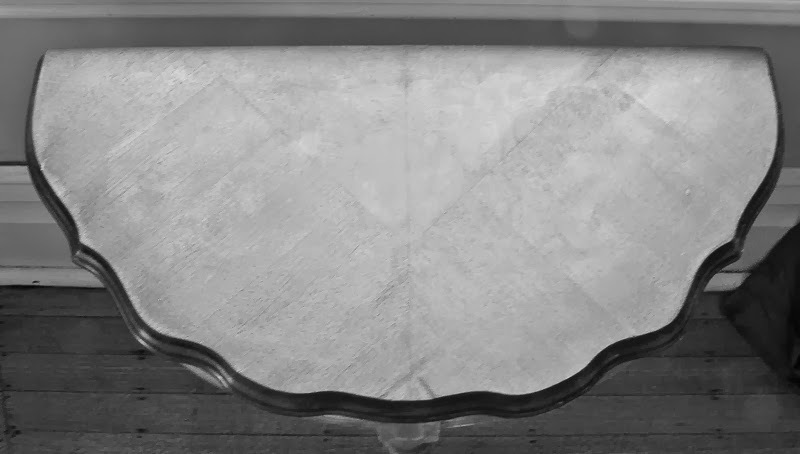 I dry-brushed the grayish white paint over the details and then rubbed it in in some spots. I know that MMSMP has a white wax that would do the same thing. I did not have any, so dry brushing is always an option. I have another little table that I am going to show you in a few days where I dry brushed gold glaze on the leg details and I love it! Can't wait to show you! Little Blue is for sale in my booth if you are feeling a little blue…..
As always, thank you so much for stopping by during your day to listen to me ramble. Such a beautiful blue! I love it, Kim! Wow- I love that! The color is great and it would look perfect in my entry hall. It's gorgeous--love that you did the white dry brushing. Thank you Susan. I was nervous at first with the white but once I got going I loved it. 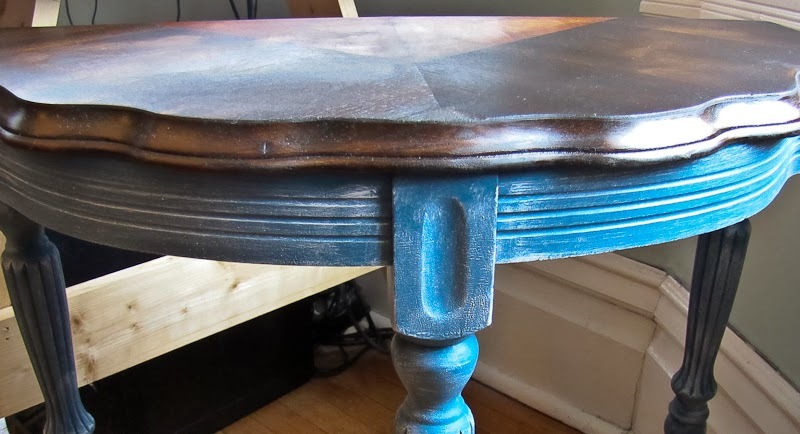 You must be feeling the blues with these sweet little table makeovers. Love this one! Thanks for sharing at Fridays Unfolded! Beautiful in blue! And I need a picker too!